Deer Ridge is an incredible place where time almost stands still. For us, it was a place where all the demands and busyness of life came to a halt and allowed us to spend 5 days face-to-face with each other and with our Savior. As if that alone weren't a big enough gift, David and Louise attend to every detail of hospitality! They served beautiful, delicious, and healthy food at every meal (and snacks, treats, tea and coffee in between!) Every corner of the home was clean, comfortable and inviting. The property was quiet and beautifully tended. An extensive library and several study guides were at our fingertips! They prayed with and for us all week. David and Louise's story is inspiring. They truly understand ministry and have obediently followed God's call on their life to use their gifts and create an environment that says "I am here. Rest." David & Louis Decker are experts in detail. They carefully plan and pray for each retreat week to ensure all is perfect for the pastors & wives attending. The Deckers have created an atmosphere that makes it impossible NOT to rest and relax. 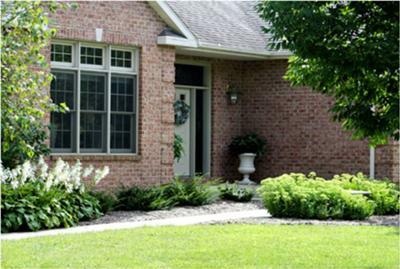 The home is surrounded by beauty: the grounds, the chapel, the back deck, every room. We experienced a week of just breathing - no phone calls, no decisions to make, nothing to plan for, no one demanding our time. The only thing on the menu was resting in God's presence. Deer Ridge has an extensive library available. They offer study tracks for anyone who wants to participate. There are games and movies to enjoy. And peanut M&Ms seemed to be in plentiful supply! Supper each night was something special to look forward to. Again, the Deckers do not leave one detail to chance. The meals were like something out of a food magazine! Time alone was precious. Time together as a couple was needed. Time spent with the Deckers was refreshing. And time spent getting to know some of the other couples was sweet. Taking the time away from your ministry for a week at Deer Ridge is a decision you will not regret. It was perfect from beginning to end and we didn't want to leave! ...accompanied by an amazing suite and delicious homemade meals! The Decker's have a huge heart for the Lord and to see pastoral couples be encouraged in life and faith. They intertwined their gift of hospitality with a healthy dose of humor and affirmation. Before the week was over we had been prayed for and with several times. There was a true sense of partnership and understanding that grew with each encounter around the table, on the deck or just passing in the hallway. If you're ready to spend some quality time with your spouse and your Savior, this is a great place to fulfill that desire. We all need 'a rest' from the pressures of life and demands of ministry. We encourage ministry couples - at any age or stage - to invest in your marriage by inviting God's presence and grace to minister in and through you at Deer Ridge Ministries! 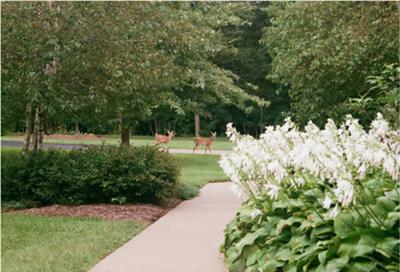 Deer Ridge is a blessing that you wouldn't expect to find in Freeport, Illinois! We were able to spend a week there recently and did not realize how much we needed it. We both slept a lot the first couple days and just enjoyed the beautiful grounds, the most amazing food and a quiet pleasant atmosphere. We are so used to going all the time, that it took a couple days to totally relax and learn to just "be". The chapel is one of the most peaceful, reflective places we have been. There is a sense of the presence of God at Deer Ridge and all of us in ministry need a place like this to get away and be with Him long enough to really listen and be refreshed in our souls. David and Louise are truly meant for this ministry, and they are blessed with an amazing team of volunteers. If you have never taken a personal retreat, please plan to do it!! Paul and I were very blessed by the kind and generous hospitality at beautiful Deer Ridge Retreat. Upon entry, there is a precious Presence of the Spirit of Christ and our hosts Louise and David are gracious and thoughtful. Peace permeates the place. Every direction provides food for the soul: beauty of the surroundings, rich libraries of fabulous resources, personal and private times, a charming prayer chapel. Dinners were healthy and delicious with abundant snacks available day and night. This was my first ever "pastor's retreat" and I was amazed at the comfort, elegance and thoughtful touches all freely offered to God's servants. May the Lord pour back rich rewards to the volunteers, supporters, and our loving hosts. My husband and I felt rested and encouraged by Deer Ridge Retreat. Wonderful accommodations, food and fellowship! Top notch all the way around! So very worth the trip! A+ all the way! Our time retreating at Deer Ridge was amazing. The house and the grounds are just immaculate, restful and beautiful. Time there was a perfect blend of rest and rejuvenation, as well as, much needed community. The directors, David and Louise, are genuine, inviting, and so kind. We have come away from there renewed! You are welcome to take a rest! We were sent to Deer Ridge Retreat Centre by our supporting church for the closure of our five weeks‘ sabbatical. From the very beginning to the very end we felt that this place and time was handpicked by God for us. When we arrived we were just astonished by the the beauty of the place – the house was carefully decorated in style from the dinning hall to the bedroom, inviting to have some private time in its plenty hide-aways and places to use, including a nice patio with the tranquilizing sound of a water stream, spacious yard and a separate chapel. The only meals we were asked to have together with others around the table were dinners that were always delicious and beautifully served with love by the volunteers. We felt very special! There were two major things that David and Louise Decker, the enthusiastic couple behind the whole project of this retreat centre, communicated to us by many different ways, here they are: you are WELCOME and take a REST. This was exactly what we needed. Those five days were very special for us, because we knew God was speaking to us. He was speaking to us through the prayer time with the Deckers, through a quite time with Himself and eventually even through the sharing time around the table. The topic he was teaching us about was the REST – that in the end it has to be found in Jesus himself: "I am the vine; you are the branches. If you remain in me and I in you, you will bear much fruit; apart from me you can do nothing. "(John 15:5). We realized that we need to be continually drawing life from the Source of Life. But in order to relearn this old lesson once again we needed this time away from other people and the routines that the people of Deer Ridge provided for us. We left with renewed assurance of God‘s personal care for us and his commitment to use us for his purposes. We thank God for his mercies, care and love we experienced in many ways during our time at Deer Ridge and honestly recommend it to all who like us need a new deep breath with the Lord! The last phase of our sabbatical was rewarding and rejuvenating. The setting, the accommodations, and the food were top-notch. Louise is an excellent chef! The Decker's goal of rest for all of us was graciously accomplished. Thanks to the individuals, churches, board members and volunteers who make this retreat possible for those of us in ministry. We would highly recommend this place of peace and rest. Our time at Deer Ridge was part of my Sabbatical. After a challenging season of Minisrty I really didn't want to be with any people. In my spirit I was reluctant to sit at the dinnertable with other ministry couples and be social. But, in the Lord's own tender way, this was exactly what I needed. To be reminded that I do have a place at the table, a place reserved just for me at God's Great Banquet Table, that I belong, that I matter, that I'm welcomed, that I'm valued. Thanks to the Deckers and their supporters who make this vital ministry possible. Deer Ridge Ministries retreat center gets an A+ in all categories. It is run by David and Louise Decker who are experts in hospitality and generous in their service. This was our first time to this retreat and we were so refreshed by our time there. The property conditions and amenities are inviting, the meals seem like they jump right out of a magazine, they have volunteers who serve during the meals. You sincerely get to focus on just getting refreshed for the time there. What a great get away run by two amazing people. We have since been recommending it to any who will listen. We will definitely be back and loved our week at Deer Ridge! Our stay at Deer Ridge far exceeded our expectations. The directors/hosts, David and Louise, were so gracious and caring. We so appreciated the time they took to listen to our ministry/personal needs during our one-on-one time/prayer with them. Their genuine love and concern for pastors/wives is truly evident. The facilities are top notch, including the extremely inviting large guest rooms and comfy beds. It was exciting learning how God provided for all the furnishings and décor in this beautiful home. The prayer chapel was perfect for our alone time with Jesus. The food was also amazing; and we so enjoyed the "table talk" with our hosts and other guests. God met with us at Deer Ridge, giving us a much needed rest and time to enjoy each other. Thank you so much, David and Louise. May God bless you as you continue to follow His leadership in the ministry He has called you to. You are loved and appreciated!! I was able to get away for the full week and my wife was able to join for 2 days. The Deckers have that excellent balance of protecting their priority on rest (no wifi available, poor cell service, discouraged to "work" on ministry items) and growing (pre-designed mini-growth activities/readings/videos) and plenty of free time for prayer, sleeping, hiking at a great park near-by, etc. Food and atmosphere is top notch and they strive for excellence in all they do. Not having attended a retreat like this before, I was not sure what to expect. It exceeded my expectations in every way! The Deckers are anointed and excellent hosts. The schedule, the food, the accommodations were excellent. Their home, the chapel and the property are ideal. The highlights of the trip for me (Charles) were the personal lunch with the Deckers, and supper around the table with the Deckers and the pastors and wives each evening. It was very encouraging, refreshing, and satisfying in every way. Check it out! You need the rest more than you know! I (Windy) arrived exhausted, so having every meal prepared and provided for us was a huge blessing to me. I felt so honored, valued and loved while there I still cry sometimes and re-enjoy it. The reading materials and study helps provided were excellent. It was a great blessing to us as a couple. We are still reaping the benefits! I agree heartily with my husbands comments. This ministry is absolute excellence! You owe it to yourself, and the Kingdom to take care of your vessel, and this is a wonderful way to fully experience Sabbath rest. This was our second time at Deer Ridge. We were there this year in June of 2016 and previously in 2014. We were in the midst of a ministry transition and having a solid 5 days of prayer and reflection time was incredible. The rest that we were allowed was invigorating and helped prepare us for the months of transition that followed. We have recommended Deer Ridge to many friends in ministry and will continue to do so. Make your reservation request today! We had a wonderful God-returning, soul-refreshing, people-enjoying, retreat! The accommodations were outstanding... as were the meals! The self-directed retreat path we chose met us right where we were at -- "Refreshment for the Weary Soul". We hope for the privilege to attend again! We enjoyed our stay immensely. It was a great place to sleep, relax, pray, read, and be treated like royalty. We were given freedom from responsibilities and expectations. It was evident everywhere how much thoughtfulness was put into even the smallest details. The devotional tracks we could choose from were well put together and augmented our purposes for being there. Meals were a highlight of each day. Louise and her helpers made every one as much a visual delight as they were delectable to eat! We enjoyed fresh flowers each night on the dining room table and followed each dinner with friendly conversation starters. We were genuinely blessed with connections formed with our fellow guests. We couldn't have chosen more delightful people! David and Louise spent time to get to know each us individually and we could sense their genuine desire to be an encouragement to us in our ministries. Restful, rejuvenating, highly recommend Deer Ridge! We are so glad we spent a week with the Deckers at Deer Ridge. It was just what we needed, more than we hoped for and can't wait to return someday. The house is beautiful, peaceful, full of books and resources. The property is so nice with deer showing up at sunset. The prayer chapel is a special place, where we were able to reconnect with God and each other as we soak in His presence. The meals were amazing. Louise is a fabulous cook. Each meal felt special, that thought and attention went into deciding what to serve. Dinner was special with conversation and encouragement both from the Deckers as well as the other guests. They have thought of everything and the attention to the small details of the retreat make it so special. We will be sharing Deer Ridge Ministries with other ministry couples we know and hope to return someday to again soak up a wonderful week of rest and renewal. One of the reasons we choose Deer Ridge was that there was no 'schedule', no sessions to attend as part of the retreat. (Just dinner) The individual curriculum they offer is wonderful-- and with many choices. I loved having the permission to take a nap, take a walk, enjoy the sunset, read a book without a schedule. I'm so thankful for our week away. What a blessing to us! After looking and praying about where to spend the beginning of my sabbatical leave, God directed me to Deer Ridge Retreats. Looking at the website, it promised all the amenities of home minus the hustle and bustle of daily routines. Boy, did they deliver on their promise! The setting was beautiful and serene; the retreat house is spacious and exceptionally clean; the chapel was the perfect place to worship and reconnect with God; the food was delicious and plentiful (Louise is an awesome cook! ); and the fellowship with the Deckers was meaningful and priceless. Their hearts for pastors were evident from the welcome handshake to the hug goodbye! I arrived a stranger, but left a friend who had been encouraged and affirmed! If you are looking for a place to relax, rest and get refreshed ... They deliver on the promise! You won't be disappointed! I know I will be making a return visit! This was our third retreat at Deer Ridge. I would encourage other pastors to take advantage of these retreats, whether at Deer Ridge or elsewhere. It's a wonderful opportunity to rest in green meadows and let God restore your soul. We deeply appreciate the loving ministry of David and Louise and their team at Deer Ridge. We left refreshed and recharged and ready to serve Jesus and his church with fresh energy and strength. Amazing retreat, even more amazing people! This retreat was exactly what we needed. We got to unplug from all work and distractions, how often can you do that at home?? DRM offers a quiet, peaceful environment for you to spend time with Jesus and your spouse. The hosts are wonderful people, some of the best you will ever encounter. If you are a pastor, you MUST take the time to spend a week at DRM, you will not regret it! We had a wonderful week of rest! The Deckers pampered us and made us feel God's love in a tangible way. I would highly recommend carving out time in your busy schedule and getting it on your calendar. Deer ridge is such a tune of renewing, refreshing and a breath of fresh air in a very polluted world. The host, The Deckers, provide the gift of Hospitality, Wisdom, Compassion and many more to allow you to grow closer to God and man. The meals are absolutely 5 Star and the accommodations are better than any B&B I've ever stayed. The Chaorl is an incredible splice for personal time with God. I HIGHLY recommend Deerridge to all pastors and spouses. Highly recommended to pastor's and spouses. Excellent hospitality and accommodations all the way around. Each room has a nice private place of study, bathroom and outstanding bed. Plenty of places to rest, read and pray around the house, on the deck, or out in the yard. They also have a separate cabin for prayer. The Freeport area is very nice, with golf, disk golf, parks, and other interesting places to explore. We had a great time with the other guests and felt loved and respected. Thank you Deckers for your vision and ministry! A Wonderful Gift and Blessing! We just returned from spending five delightful days at Deer Ridge and were abundantly blessed in so many ways! It's a great place to invest quality time with God and your spouse. David and Louise provide a haven of rest, more rest, renewal, and restorative reflection. They partner so well together and clearly are called to provide loving care to God's shepherds. We highly recommend it and look forward to a return visit. 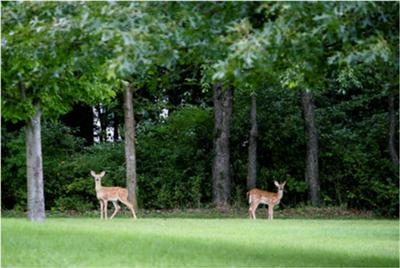 In a rhythm of abiding and fruitfulness, rest and work, Deer Ridge is the perfect retreat for such abiding and rest, prayer, reflection, renewal and more rest. The hospitality is gracious and generous. The accommodations are five star. The food is bountiful and delicious. The fellowship, encouraging and joy-filled. David and Louise have fully embraced a ministry of caring for caregivers. As return visitors, we will continue to make Deer Ridge a part of our personal and ministry rhythms. Blessings and Thank you! We just spent a peaceful week at Deer Ridge. We came home refreshed and ready to jump back into ministry. The house is wonderful, meals were great, fellowship and self studies were helpful. They also have a prayer chapel for time alone. We highly recommend Deer Ridge! Our time at Deer ridge was both peaceful and completely refreshing. The time spent in the prayer cabin, walking the grounds and neighborhood, watching the deer roam the backyard, and listening to the songbirds in the moring while laying in bed, were all things which infused us with the love of God and the feeling of a renewed call from God. We also enjoyed the time to meet new ministry friends and hear how God is working in their lives and ministry. What a great week! We really feel ready for what God has next for us and our church. Thank you David & Louise for your love and care. My wife and I loved our time at Deer Ridge. We had no idea what we were getting ourselves into, but it was definitely the most refreshing time I have had in the last 6 years. It is so nice to turn off life, phones, technology, and even little responsibilities here and there and spend four days seeking Gods face in the Word and prayer with my wife. I could not recommend it more. Today we stop to remember the wonderful gift that Deer Ridge Ministries gave to us in May of this year. David and Louise were gracious hosts and have an obvious heart for pastoral couples and the ministry of the local church. We felt very well cared for. We thank God for you David and Louise! The word of God warns us "Do not forget to show hospitality to strangers, for by so doing some people have shown hospitality to angels without knowing it." My wife and I recently journeyed to Freeport, IL., and well, we are aware that our hosts at Deer Ridge Ministries are indeed angels. We were encouraged, pampered, and challenged to rest in the arms of Christ during our 5-day stay. It was simply wonderful! We had a joyous and delightful experience with God. Through our angels, God provided delicious meals, splendid lodgings, stunning comfort and scenery, and meal-time conversation which were sincere and genuine. The experience was a much needed breath of fresh air - An experience we highly recommend. Thank you Lord for the angels you provide. Amen! Refreshing week - we are grateful! My wife and I had a wonderful week of renewal and refreshing a few weeks ago at Deer Ridge in Freeport IL. We shared the week with three other pastor couples. The ministry is a class act. The accommodations are extraordinary. The quality of the facility and the privacy provided is excellent. The attention to detail is noticeable. The balance between connecting with other couples and the freedom to create one's own schedule is appreciated. Each evening, we gathered for a dinner that should have been featured each evening on the Food Network. The conversation was rich. The creative cuisine was anticipated each night. The week will become a regular plan for my wife and I to deepen our personal walk with the Lord and to invest in our marriage relationship. Thank you ... thank you ... thank you to David and Louise Decker who set a wonderful table, making it available to pastors and spouse regularly. Such a gift! What a great place to relax and be renewed! This is my second time at Deer Ridge and I cannot say enough about it! David and Louise Decker are great as they cook, counsel, and console you into a refreshed and renewed state. It seems like every time I go to Deer Ridge I receive a new word from the Lord and become encouraged to forge on in ministry. I was so blessed again by my stay at Deer Ridge and I can't wait to head back! I am so thankful to God for David and Louis Decker, directors of Deer Ridge Ministries in Freeport, IL. My wife and I just came off a very busy season of ministry and were in need of rest. From the moment we arrived, the Deckers made it clear that this was a place set apart by God for that very thing - REST. Our Sabbath rest retreat provided us time: time with God and time with each other. We enjoyed the comfortable and private room, incredible meals, encouraging conversations, and beautiful surroundings. A nearby park was the scene of one of the most fun dates we have enjoyed for a long time. We felt like kids again! Thank you, David and Louise, for answering God's call to provide pastors and their spouses with a special place for rest, refreshment, renewal, and recreation. We just spent this past week at Deer Ridge. Our expectations for everything we went there for, rest, relaxation, time with God were met or exceeded. The food was wonderful. The room accommodations were spacious and comfortable. Everything was pristine in condition. David and Louise made us feel at home and also made sure to give us the space and time we needed. SO thankful for our time there. I was seriously looking for a Pastor's Retreat and when I was directed to Deer Ridge Ministries, I found just what I needed. The setting was beautiful and relaxing. The home was inviting and aesthetically pleasing in every way. The food was great all the time. David and Louise Decker are gracious hosts and made it their business to make our time spiritually and relationally meaningful. My desire was to meet with God and I was able to do just that. I am so very grateful for this ministry provided for us Pastor's and wives. What a need, met! We are missionaries in Mazatlan, Mexico. We just visited Deer Ridge and loved it. We had lots of time to read, pray, rest, and relax. Louise and David treated us like royalty, pampering us with delicious food, kind attention, and encouragement. We enjoyed borrowing the retreat center bikes and kayaking at the large city park. We would highly recommend a visit. My wife and I recently had a much needed rest and healing at Deer Ridge Retreat! David & Louise are warm hosts who encourage you to take time away with the Lord! They pray for your needs but they are not pushy. They let you know that they are there for you anytime. The meals are wonderful and healthy. Dinner is a time where everyone sits down together at the table for food and conversation. The readings at the table are encouraging and the guided questions help us to open up and share! If you need a place to come and heal and refocus then this is the place to come too. Very thankful for the new friends we met and for servents like David & Louise! R & R Found Here! David & Louise Decker, our host & hostess are uniquely gifted for hospitality & affirmation & encouragement of both pastors & spouses. They provide a very loose schedule & emphasize rest, napping, prayer & have plenty of literature to refresh & challenge a servant's heart & mind. The evening meal is always delectable & the guided (& Iimpromptu) conversations foster mutual care & deeper relationships with each other. Anita & I returned to serve our Lord with renewed vigor! Blessing on all who make such a retreat a reality! David & Louise Decker, our hosts, excel at affirming Pastors & their spouses. The Retreat philosophy allows for unstructured schedules with a high emphasis on resting, napping & prayer with lots of reading & collegial conversation available, but not required. Supper time is an awesome meal with other couples & guided conversation to promote deeper relationships & mutual concern for one another. Anita & I highly recommend this week of both withdrawal & engagement & thank God for placing pastor's & spouses' needs within the Decker's hearts! From the time we arrived to the time we left we sensed a peaceful, renewing atmosphere. Our hosts, the Deckers, were gracious servants that cared for our every need. Even to the point of making sure the deer were in the yard as we walked up to the home! Ha! David says he has them on a "retainer". We laughed, prayed, studied, engaged in fellowship with one another, and enjoyed excellent meals. It was just a wonderful time to retreat. Or should we say "advance" in our walk with the Lord and each other!? Rest and Renewal...indeed! Recently, I had the distinct privilege of going to Deer Ridge Retreat for a five-day sabbath rest. I can assuredly say, after being there, that I definitely needed this sabbath rest. My experience has rekindled a fervent desire for closer fellowship with Jesus Christ and His precious Spirit. The atmosphere at Deer Ridge is at once restful, peaceful, yet also spiritually stimulating; invigorating. The directors of this retreat conduct this ministry with the highest level of quality and love. I have returned so touched by Christ's love through His Spirit and His people. I simply cannot emphasize enough what a treasure this ministry is and encourage ministers and missionaries to partake of this extraordinary blessing. My wife and I were truly looking for rest and renewal, and found it. Dave and Louise are wonderful hosts, the accommodations reflect relaxation, and the ability to connect with both God and spouse is abundant. Just go; you'll be glad you did. Dave and Louise are humble servants of the King who open their hearts and this beautiful home to other servants who just need a place to experience grace, love, and the fellowship of other brothers and sisters. There is space and time to just get away and do whatever one needs to be refreshed and renewed, and then there is sweet time around the dinner table and (if you choose, other meals) to enjoy well-crafted, delicious food with other brothers and sisters. I was so grateful for this gift from God. Thank you Dave and Louise, and to all the supporters who make this possible. We had a wonderful time at DRM! They provided us with first class accommodations, first class meals, breakfast, lunch and dinner. The environment is so appropriate for a week of rest and relaxation. Louise and David are wonderful hosts that are able to relate to the pressures and stresses of ministry. We left encouraged, relaxed and blessed! We had a wonderful time at DRM! The accommodations were 1st class as well as the meals, breakfast, lunch and dinner. Louise and Dave are so special and they make the retreat as pleasant and rewarding as possible. We were blessed to get to know so wonderful ministers who participated in the retreat that week. We left encouraged, relaxed and motivated to continue our service for the glory of God. Thanks Dave and Louise! My wife and I were blessed to be able to stay at Deer Ridge twice now. Both times we heard from God, grew closer to each other, and were recharged for ministry. The presence of God is there, and Dave and Louise are true servants of God. EVERY pastor should go, you will not regret it. Deer Ridge - A Tremendous Blessing!!! It has been one year ago, but such a blessing made it seem like yesterday!! We must use this opportunity again to thank David and Louise for their invite to such a wonderful week away from home. The setting, the sumptuous meals, the rest, the comfort, the readings and lessons that rekindled the fire between us......we must say we are eternally grateful to you both. It is our prayer that God will continue to truly bless your ministry of love to so many pastors and their spouses. We definitely recommend this retreat for all pastors and their spouses who need to reflect on ministry and rekindle that fire in their marriage. Deer Ridge isn't just a place to rest, but a place where you can be spiritually renewed. I was worn out and in need of rest and found not only that but good people, good food, and good counsel. I will always look back fondly at my time with David and Louise at Deer Ridge and can't wait to visit them in the future. They were more than good hosts, they became my friends. I highly endorse Deer Ridge Ministries and encourage any Pastor who is seeking rest and renewal to look to my friends at Deer Ridge! At Deer Ridge, my wife and I were greatly encouraged as we were treated as honored guests by hosts David and Louise Decker. Resting, reading, and reflecting in such a caring environment helped bring renewal to our hearts as we returned to our place of ministry. We deeply appreciate this haven of rest for pastors. It provides the place and space that we need to connect with God, his purposes and one another in a deep way! Deer Ridge was an amazing oasis of rest and relaxation. David and Louis do a fantastic job caring for pastors and wives while giving them lots of space to rest and hear from the Lord. The facilities are beautiful and extremely well kept. The food is absolutely delicious. We would highly recommend Deer Ridge and look forward to returning in the future! This was a great sabbattical rest for us...from the beautiful home and surroundings to the "above and beyond" way we were treated, we instantly found ourselves in a place where we could quiet our hearts and lives and just be in God's presence and at rest. We were both amazed and humbled by both the love and the heart for pastors that David and Louise shared! We would highly recommend this retreat center to all pastors! At a recent Deer Ridge retreat, I decided one morning to be quiet before God and ... listen. I asked God for a number - a chapter in Psalms - that He wanted me to read. After just a few minutes, the number 42 came to mind. I opened my Bible to read, "As the deer pants for the water brooks, so my soul pants for You, O God." I confessed that I rarely just long after God for who He is. A quiet heart, a listening ear, a timely Scripture, a humbled heart, a restored soul. That's one of many things I experienced at Deer Ridge. Thank you, David and Louise. Five stars isn't enough. From the moment we stepped out of the car, we felt the peace and presence of the Lord! The accommodations are very beautiful and clean. This Sabbath retreat is done right. Thank you David and Louise for being great hosts! It is our desire to return again! Look up the term, TLC – Tender Loving Care, in the dictionary and a picture of Deer Ridge Ministries will be found. The ministry is a precious gift from the Lord. During the week you will be reminded that God really does know your needs, and that’s why He created Dave, Louise, and Deer Ridge Ministries. Beyond first class accommodations and meals, the presence of the Lord is felt as soon as you begin to follow the road and drive onto the property. That feeling only becomes more intense as you enter the retreat house and find yourself surrounded by the love of the Lord. No tricks, it’s true! Go, be pampered and loved, and refreshed as you spend time with the Lord as well as an amazing host couple. God ordained it just for you! Exactly what we have longed for! After 25 years in full-time pastoral ministries, we have finally found a place that God uses to restore and refresh those who serve Him. We were welcomed with open arms and hearts. The food, fellowship and freedom to relax were all amazing. David and Louise had study tracks available that guided us through books, CDs, and DVDS in order to help us relax and restore. We rested, prayed, read, walked and drew closer to God as well as to each other. We are thankful for the time that we had and believe that every pastor/missionary would benefit from the encouragement that Deer Ridge Ministries has to offer. We are forever grateful to God for our time at Deer Ridge. May God Bless All Who Enter These Doors! This was our second retreat at Deer Ridge, and once again, it was a huge blessing. The quiet atmosphere, the fabulous food, the freedom just to "be", and the beautiful surroundings all added to the peace and rest we craved. We're already discussing a date for our third visit. We highly recommend it! This is a beautiful, restful, amazing retreat center. This was our first time going and we were very impressed. The atmosphere is relaxing and the food is the best! We would recommend this place to anyone and will return ourselves. I think that's the word that most summarizes my wife's and my stay at Deer Ridge: decompression. Or to be more precise: sanctified decompression! I didn't realize how tired I had become. What a joy to reconnect with my wife, with the Lord, and with the simple joys of life (as we went on walks, watched good movies, ate delicious food). I highly recommend a week here to revive the soul and rekindle that passion for ministry. Deer Ridge is exactly as nice as it looks on the web site. The Deckers were accommodating and gracious. The food was delicious. It was a wonderful time of relaxation and reflection. I would recommend any minister to take a trip to Freeport. The Best Host and Stay available!!! David and Louise of Deer Ridge Ministries are top notch in providing a place of "refreshment" for pastors and their wives. I've been blessed to attend a sabbatical rest at two different times and they were so good at making me feel "right at home". If you need time away or a time to reconnect with God then I would highly recommend Deer Ridge Ministries! I promise you will not be disapppointed! We've been to Deer Ridge FOUR TIMES!!!!! My wife Marian and I are simply in love with David & Louise and their wonderful ministry to pastors & spouses. We've traveled to Freeport from St.Louis, MO a number of times over the years to take advantage of the free pampering that they do. My wife has even traveled by train to attend the pastor's wives gathering. Every pastor should make it their business to get alone with the Lord and their spouse at one of Deer Ridge's retreats. It is an oasis of rest and relaxation and reconnecting with the Lord and each other. From Florida and certainly worth the trip! When we went to Deer Ridge Ministries, we didn't know what to expect. All we knew was that we needed something. Wow, what a reTREAT this was! We were met with a warm welcome and made to feel at home immediately. Then we were given time... Time to unwind, time to think, time to reconnect with each other and with God, time to share with other pastors and wives. We found David & Louise to be wonderful hosts who really understand ministry. We were blessed by their hearts and wisdom. We loved the fact that not really much of anything was expected of us...except to slow down. A daily syllabus, that took a short time each day for us to do...and helped us in our inner revival, wonderful books that edified, movies to enjoy, meals that are delightful, fellowship around the table that was real and much needed "alone" time. We cannot express how very important it is for every pastor to take advantage of this fantastic ministry. We came away revived, refocused, and ready to face the realities of the ministry world. If you're reading this as a church member, please SEND your pastor. He needs it! Wonderful place of peace and rest! We were treated like VIPs! Deer Ridge gave us a greatly needed gift of peace and rest away from a stressful situation in our church. Dave and Louise were so kind, warm, and encouraging. Our meals could be featured on the Food Network...simply delicious. We enjoyed a nearby biking trail and long walks together. We can't say enough good things about it and we hope to come back again soon. Deer Ridge is a wonderful place to totally step back and regain your strength. It is so well prepared for your time. From the beautiful facilities and grounds, to the food, to the host and hostess just being so aware of what a Sabbath should be for a pastor and spouse, it is healing. You leave feeling "spoiled" and loved. We went while transitioning into a new ministry and it was the rest and prayer space I needed to reflect and reconnect with my wife to be ready for the next chapter. I highly recommend Deer Ridge. You will want to return. 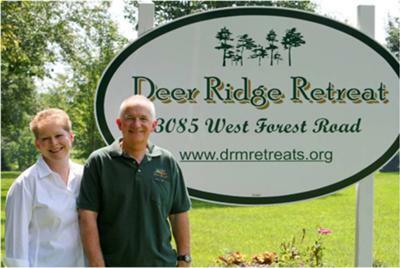 We have been "retreat-ers" for about eight years and Deer Ridge is our FAVORITE place to go. David and Louise are just fantastic. Their heart is for pastors and their mission is to minister to pastors and their wives; to make them feel loved, valued, and appreciated. They are such a blessing as they share wisdom and compassion from the heart of God. If you want to talk, they are there for you. If you want to be left alone, that's okay too! The setting itself compares to the best B&B's in the country. The beds are comfy, and the decor is lovely. It is beautiful and Louise's cooking is such a treat. Pastors, if you haven't gone to Deer Ridge, you need to-with your wife. Don't let this year pass by without booking your reservation. And the best part for pastors-IT IS FREE!! !